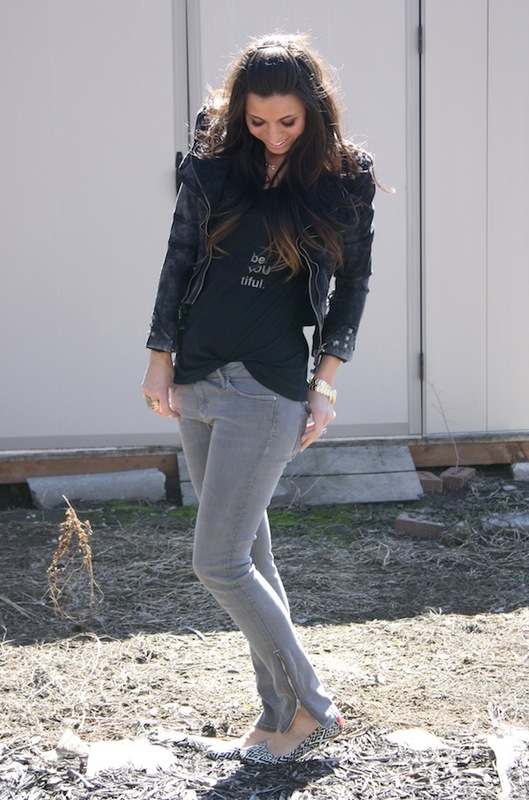 Robyn Vilate: #6 turned into outfit post! #6 turned into outfit post! alright ladies, you chose, so i posed! this was #6 of the tiny mirror photos that i let my readers choose from to turn into official "outfit posts" and i'm kind of glad you did! this one actually didn't do that great on the actual blog but blew up when i posted it on instagram (but don't worry for those of you that wanted to see the other ones, i ended up choosing 4 of the 6 because they were all almost tied! so more to come!) as for this outfit, it may be a slightly simple jeans and tee look, but the added edgy jacket and zipper pants definitely create a fun look! 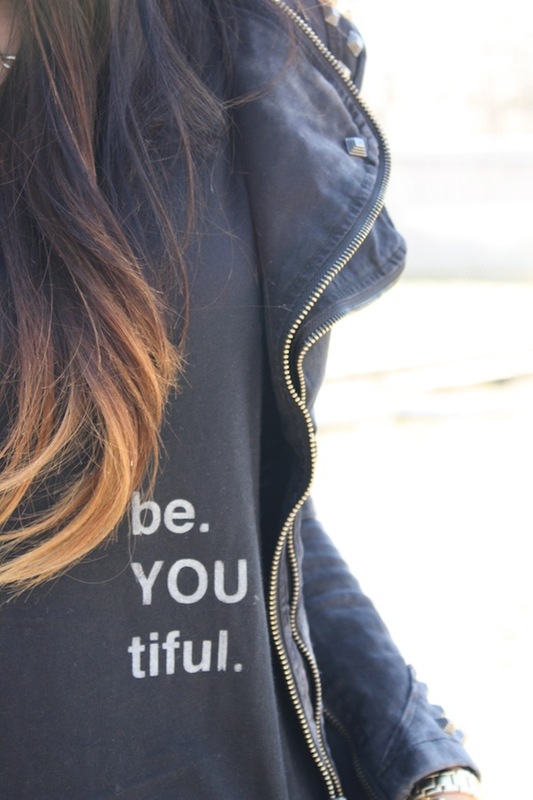 this adorable be.YOU.tiful tee from good hYOUman is not only adorable but gives such a sweet, positive message! i kind of want one in every color! i hope you have been loving these mirror shots made into outfit posts and keep reading for a chance to win one of these amazing feral watches coming soon!! I love that close-up shot of the tee. Great message! What's your Instagram? I'll follow you from my unofficial blog one lol ( @brittanylanders ). such a great outfit! love your jacket! This outfit is so cute! So wearable and fun. OMG I love love love that Tshirt! Super cute outfit! I always end up swooning over this jacket. Love it! such a cute outfit! I love how all your outifts looks like you could be in a bike gang! Maybe I could pull off that look now that I have my new rocker bangs. :) Thanks for the inspiration sista! Love the jacket and the zipper detail on the pants! Your face always looks so flawless, what do you use? !